LMU researchers show, for the first time, that the orientation of the plane of division of neural stem cells at a specific stage during embryonic development determines the capacity of the adult brain to replace nerve cells. Neurodegenerative diseases such as Alzheimer‘s or Parkinson‘s, but also strokes or other types of traumatic brain damage, result in the death of nerve cells in the brain. Since the mammalian brain is capable of replacing nerve cells only in certain restricted regions, such nerve-cell loss is in most cases permanent. Similarly, the capacity to form new nerve cells in the mature brain is limited to specific areas. The cells responsible for neurogenesis in the mature brain are called adult neural stem cells, but little is known about their developmental origins. Now an international research collaboration led by Magdalena Götz, Professor of Physiological Genomics at LMU’s Biomedical Center and Director of the Institute for Stem Cell Research at the Helmholtz Zentrum Munich, has demonstrated that the mode of division of stem cells has a profound influence on the numbers of adult neural stem cells formed during embryonic development. The new findings appear in the journal Neuron. Neural cells develop from progenitors called neural stem cells, which are produced in large numbers during embryonic development. However, in the mature mammalian brain, very few of these progenitors survive as so-called adult neural stem cells capable of generating new nerve cells. In order to determine what enables these cells to retain their stem-cell character into adulthood, Götz and her colleagues took a closer look at neural stem cells in the developing mouse embryo called radial glia cells (RGCs). RGCs form long processes that span the apicobasal axis of the neuroepithelium and their nuclei come to lie close to the apical surface which faces a fluid-filled cavity known as the ventricle. When RGCs divide, some of the daughter cells again are RGCs, i.e. the RGC self-renews. These cells that retain the self-renewing capacity, a characteristic of stem cells, are the source of the adult neural stem cells found in a specific region of the developing brain called the lateral ganglionic eminence, which forms the lateral wall of the ventricle in the adult brain. 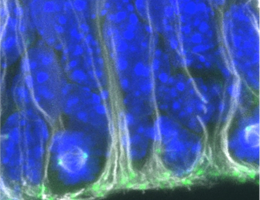 The nerve cells derived from the adult neural stem cells subsequently migrate into the olfactory bulb, one of the regions in which new nerve cells are integrated in the mature brain. “We have now shown that the orientation of the plane of division of embryonic progenitor cells has a major impact on the production of adult neural stem cells,” Götz says. The plane of cleavage during cell division determines which parts of the cytoplasm are inherited by the two daughter cells. Most of the RGCs in the lateral ganglionic eminence were found to divide along a plane that is approximately vertical (at an angle of 60-90°) to the apical cell surface. However, when the researchers genetically randomized the orientation of the cleavage plane – such that the frequency of oblique or horizontal divisions was increased – the number of adult neural stem cells generated was significantly reduced. Hence the orientation of the cleavage plane of RGCs is a crucial factor that affects the number of adult stem cells. However, timing also plays a crucial role. Adult neural stem cells are produced only during a specific, temporally and regionally restricted phase in embryonic development. Genetic randomization of the cleavage plane progenitor cells in the post-natal mouse brain proved to have no effect on the number of adult stem cells. The total number of adult neural stem cells produced is a crucial determinant of the brain‘s capacity for repair and regeneration, because each of these cells can generate only a limited number of new nerve cells. “With a better understanding of how the formation of adult neural stem cells is regulated, we could look for ways of ensuring that other embryonic neural stem cells maintain this capacity, and perhaps even persuade other cell types to do so. Our new results represent an important step toward this goal,” says Sven Falk, first author of the new study. The researchers hope that their findings will open up new approaches to the therapy of neurodegenerative diseases.